One Anne Arundel County company knew it had a revolutionary product when a local business, a makerspace, and an online group rallied around its idea to transform the landscaping industry. The story begins 15 years ago when Nick Carlson, now 32, started a side business after graduating high school. What was once a job for extra gas money, turned into a legitimate landscaping company, doing more than $1 million in business per year in residential and commercial projects. But along the way, Nick found a few challenges. About three years ago when Nick was planning for mulching season, he thought there must be a quicker way to transfer the heavy load out of the truck bed. It was the middle of winter and his company was busy battling the ice and snow by salting local properties. He started to wonder if a machine, similar to a salter, could work for mulch. While that original idea didn’t pan out, it prompted Nick and his dad, Craig Carlson, to collaborate and find an innovative solution. 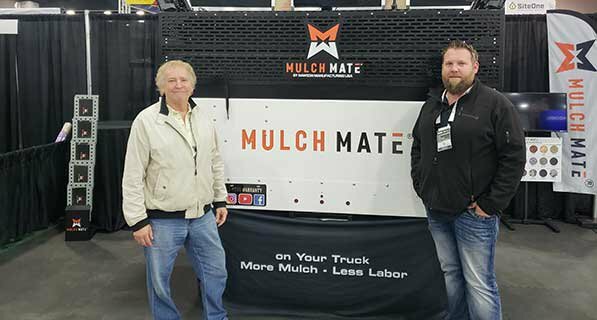 Six months later the father-and-son pair came up with something similar to today’s version of the Mulch Mate, the premier product of their new company, Dawson Manufacturing. Since then, the duo has sold each of their respective businesses to focus entirely on Mulch Mate. Mulch Mate dispenses 10 yards of mulch in 10 minutes, and saves 50 percent of the time spent on a normal mulching job. The price is low and the set-up is easy—the environmentally-friendly product costs under $30,000 and mounts on existing trucks. It even has a rear camera, which will soon be required by state law for trucks of a certain size. The size, cost, and mobility make Mulch Mate the most competitive product of its kind on the market. The Carlson team believes Mulch Mate also helps with employee retention. Workers save time and effort while unloading the truck. Since Mulch Mate is all-electric, it’s virtually silent; other products run loudly on gasoline or diesel. The noise factor allows the Carlson team to communicate efficiently with their workers without interruption, and work later in the evening without disturbing residents. To develop Mulch Mate, the Carlsons needed to find a company to cut the metal for them. While heading to lunch one day, they passed Baltimore’s own City Garage and had their “light bulb” moment. The Foundery – a 20,000 square foot makerspace in Port Covington – had recently relocated to City Garage with help from Sagamore Ventures, the venture capital arm of Plank Industries. With access to welding, lasers, and metal fabrication tools, Craig Carlson knew this space would help create the first Mulch Mate model. “The Foundery provided the equipment and knowledge needed for us to build our first prototype,” said Carlson. ‘We thought, ‘they have all the necessary equipment we are looking for.’ So we joined, took classes, and within a week we were cutting some of the biggest metal pieces ever seen in their facility. After seeing them in action, The Foundery knew the Mulch Mate team was serious. Demian Costa, managing partner for Sagamore Ventures, took notice. Carlson remembers the high praise they received from the military veteran and investment partner. But the praise didn’t stop there. Ed Wright of Frederick-based Wright Manufacturing, an innovative supplier of stand-on lawn mowers, told the team he’s blown away by their effort. Wright was so impressed with the product that during a meeting with Dirt Monkey University – a major online player in helping landscaping businesses across the country succeed – he suggested stopping by to see the mulch product in person. “Once Ed saw it in person he said, ‘Wow… so you went from concept to this machine in two years? That is almost unheard of,’” Carlson recalled. Dirt Monkey founder Stan Genadek, who regularly offers mentorship and marketing assistance to landscaping contractors, told the company they will ‘change the industry’ with their equipment. He was so impressed, he offered to do a promotional video on YouTube for free. He even previewed the company on Instagram—scoring nearly 100,000 views in just three weeks. Now that the video is live, the word about Mulch Mate is spreading quickly. From October 17-19, the Carlson team is traveling to Kentucky to exhibit at this year’s Green Industry & Equipment Expo (GIE Expo), the largest showcasing of outdoor power equipment, landscaping equipment, and lawn and garden items. The company will have its brand new machine running inside (powered by two car batteries) and will be performing live wheel barrow-filling demonstrations outside the venue. Carlson is anticipating a huge reaction. Mulch Mate is currently patent pending and should be certified by the end of the year. 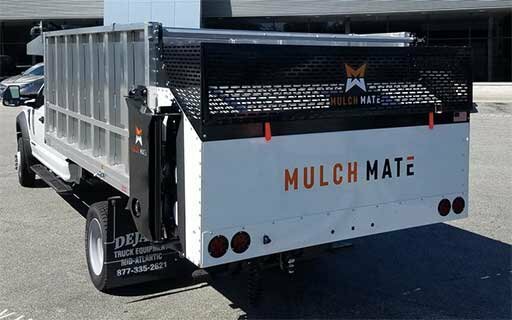 For more information visit mulchmateusa.com.